Although I thought that this week's Challenge would be difficult, it turned out to be fairly simple and straightforward. 1. Over the past 150 years there have been a huge number of floods in North America. But what do THESE floods have in common? They're all floods that have been caused by dam failures. 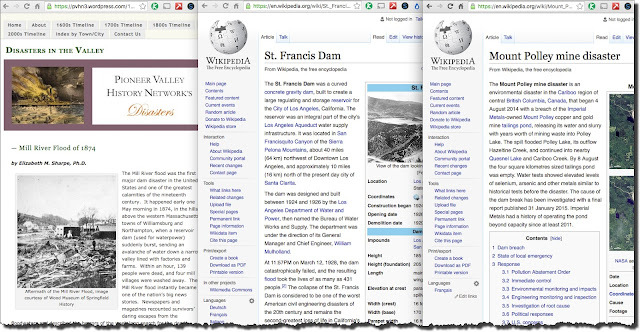 This wasn't that hard to discover--the unusual phrases "dam failure" or "dam disaster" or "dam break" appears in all of the first several hits for each flood. Here's a set of sample side-by-side articles. You can't help but notice that a dam appears at the center of each disaster, be it from 1874 or 2014. Dams still have the potential for catastrophic failure. Three results side-by-side for comparison purposes. 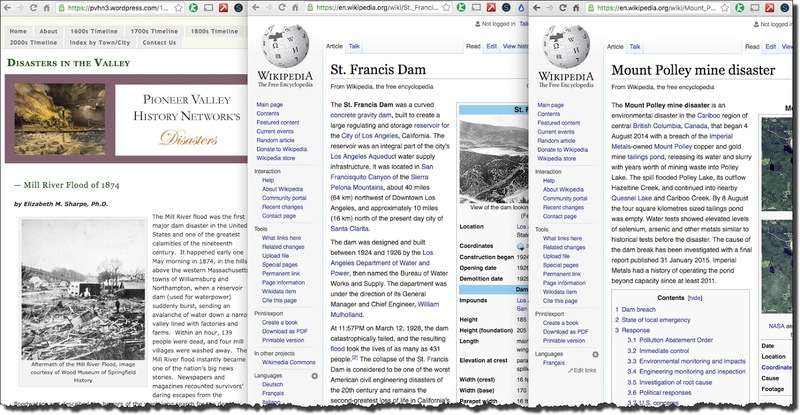 Note that I did NOT include the exact date of each flood (such as "May 16") in the queries. Why not? Because I was worried about inexact reporting, or about the floods being spread over multiple days. Since the floods would be fairly dramatic, I didn't want to overlimit the results by including the specific date. Okay.. that was easy... what about the flowers? 2. 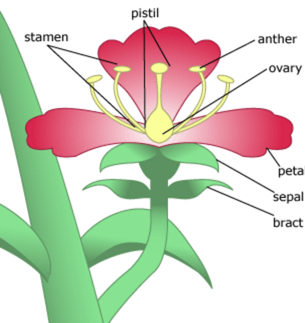 What do these flowers all have in common? brings out some great results, all of which point out that each of these flowers have large, prominent bracts (if you [ define bract ] you'll learn that a bract is usually differ in shape or color from leaves and flowers. Leaves may be anywhere along the stem while bracts are generally located on a stem just below a flower, a flower stalk, or an inflorescence. They're also often more brightly colored than the true flower's petals, not always, but when they are, they can be confused for petals. That was fairly quick and easy. I hadn't thought that there would be article anticipating my Challenge! Yes, each of these "flowers" is actually a tiny flower surrounded by large, brightly colored bracts. The "petals" of the bougainvillea are really bracts! 1. Sometimes you can find things that other people have already worked out! The floods shared the "dam" cause, and that was pretty easy to find. In the case of the bracts, someone else had already written about this. So I'll have to do another SRS Challenge to probe this basic search skills. 2. Leaving out super-precise details is often a good strategy. As you saw above, I left out the exact date of each dam disaster, hoping to avoid adding in TOO much detail (which might be spurious, especially for events that happen over the long period of time). Of course, if I hadn't found anything, I would have added the dates back in... But I start my searches broadly, and add in nitpicky details when required. 3. When comparing different versions of something, a large monitor (MORE displays!) is often really handy for doing side-by-side comparisons. When you see things side-by-side, it reduces your cognitive load, and will let you see things that are otherwise tough to see. If you don't have a large monitor, try one for a while and see how it changes the way you work. You might it really useful. As you can see, it's really pretty hard to predict how hard (or easy!) a search Challenge might be. When you create assignments, be sure to solve them yourself ahead of time to see if things really are the way you believe they are. I've been doing this kind of Challenge writing for years, and I STILL can't predict how easy, difficult, closed or open-ended these things might be. Check your assignments first! SearchResearch Challenge (5/25/16): What's in common? ... is often an important step in making sense of complex or confusing information. Finding what's common across a collection of data is often the key insight to figuring out what's going on. Scientists look for common data across experiments, detectives search for common evidence in a string of crimes. Everyone else looks for common elements between different models of things we're buying (from cars to tennis rackets to refrigerators) in order to identify what's the same AND what's different between different brands or models. So for this weeks' Challenge, I present two cases of Things that Have Something in Common. The second case might require a bit more search. Both are interesting cases of things worth noticing in the world... See if you can figure this out! This week brought the "who's on the teapot?" question (as seen on a teapot from my host's home) and a more commonplace question--"what kind of trees are those?" As it turned out, the man on the teapot took a little sleuthing to figure out. Identifying the trees (and where to go see them) was a piece of cake. So let's do the tree question first, then we'll do the man on the teapot. 2. Many of the streets here are lined with these beautiful flowering trees. What kind of tree is this? They bloom so beautifully, are they native here? which led to many pages about jacaranda trees, but the most authoritative was the San Diego botanical garden which describes jacaranda trees as "medium to large spreading tree, up to 40-50’ tall and 40-50’ wide.." and "Jacarandas are among the world’s most spectacular flowering trees with lavender blue, tubular blooms in late spring and early summer. The ferny, compound leaves provide fine-textured shade during the warmer months." (Love that phrase: "fine-textured shade"!) Yes, it is shady under a jacaranda tree, but it is made of "ferny compound leaves" that let some fraction of the sunshine through. And they are spectacular. Many places have planted these as showy trees along avenues and boulevards (even though they're quite messy as the blossoms drop to the ground). 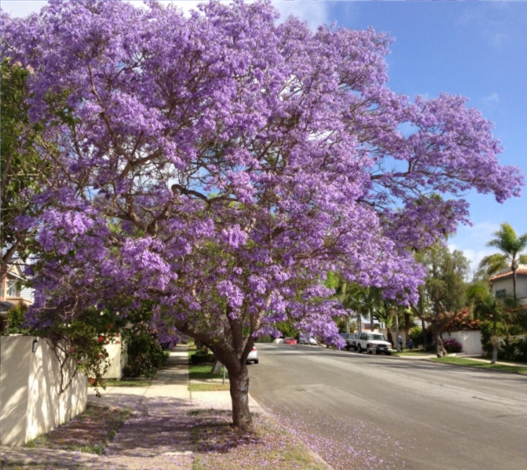 I learned that Pretoria, South Africa has quite a collection of jacarandas, planted along the streets, earning it the nickname of the "Jacaranda City." 3. As I was landing at the San Diego airport, I could see a couple of neighborhoods that seemed completely blanketed in these trees. Where should I go (nearby!) to see a bunch of these trees all lined up? 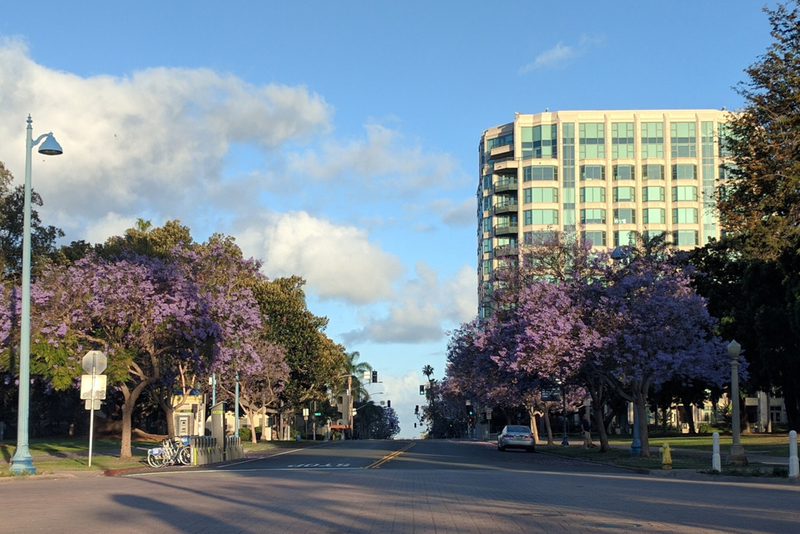 The San Diego Botanical Garden site helpfully says that "you can see jacarandas at the San Diego Botanical Garden and in South America" (where they're native). Not really helpful to direct me to "South America." Notice that I asked a question. As we've discussed before, Google is becoming increasingly competent at handling plain old questions like this. This doesn't work for ALL queries (yet), but for this kind of question--one that I suspect has many pages out there on this topic--this is a pretty safe approach. 1. I found this teapot at the place I'm staying. Naturally, I have NO idea who this guy is--can you help me figure it out? FWIW, his image is also on every teacup in the place. Who is the man, and why would someone have a tea service with his fancy hat on it? The interesting thing here is that all of the hits are for identical images (the same hat, the same mustache, the same badges... everything is identical... which makes me think this is a fairly iconic image). 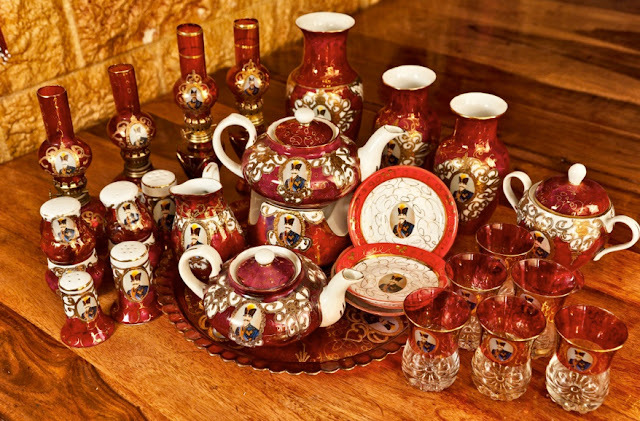 The first hit ("Cooking in small spaces") is a blog post (and picture of a tea service) from a Persian restaurant. Okay. What about the other ones? Interesting that one image would be used by two very different bloggers. THAT makes me suspect not only is the image iconic, but that searching for THAT particular image (that is, the one the bloggers use as their avatars) would probably be a useful step. So I did another reverse image search on THAT avatar image. While I found more people using that as an avatar, I didn't find the answer. I know it's probably Persian, and probably someone who's "iconic" in that culture. Who might that be? A king? 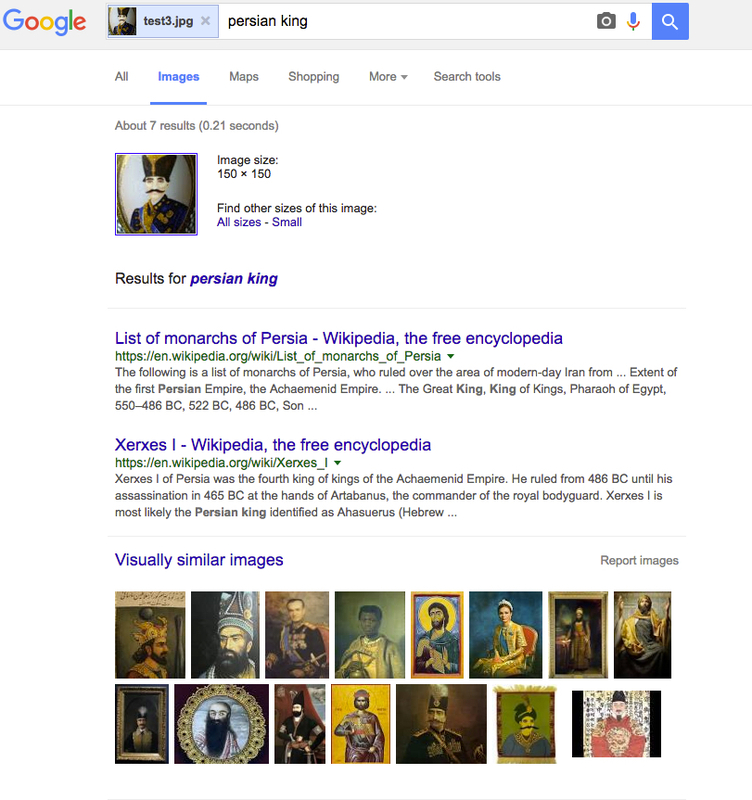 I modified the query to include Persian king (and if you know that Persian kings are also known as a shah, that term would have worked as well). Now, looking at this collection of images, I see two that look like it might be the guy on the teapot (#1 on the left in row 2, and #5 in row 2). 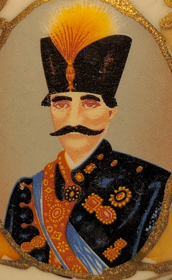 If I click on the first fellow, I learn from the landing page that this is "...Nasser al-Din Shah Qajar (16 July 1831 – 1 May 1896) (Persian: ناصرالدین شاه قاجار‎), King of Persia from 17 September 1848 to 1 May 1896 when he was assassinated. 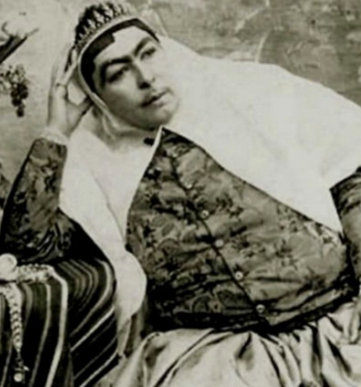 The son of Mohammad Shah Qajar and Malek Jahān Khānom and the third longest reigning monarch in Persian history after Shapur II of the Sassanid dynasty and Tahmasp I of the Safavid Dynasty. Nasser al-Din Shah had sovereign power for close to 50 years and was also the first Persian monarch to ever write and publish his diaries." (note that it was spell corrected to Naser al-Din Shah Qajar). He was a fascinating fellow, no question. The shah of Persia, with a harem of at least 100 women (including his favorite wife, Anis al-Doleh). It was a different time, a different culture, and a different standard of beauty. 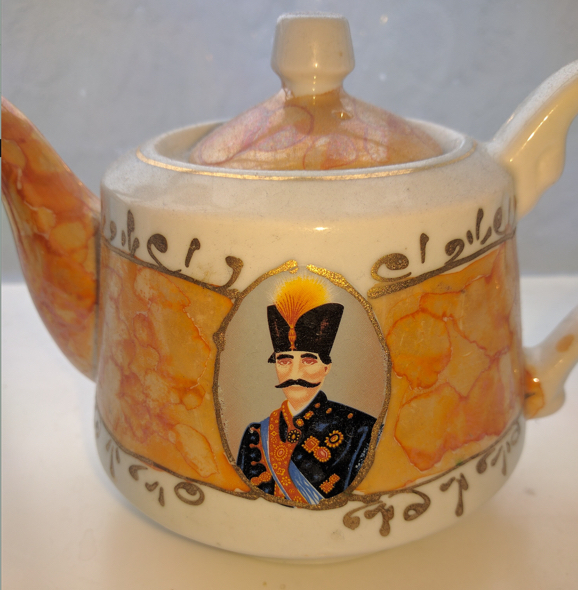 So I think we've figured it out: The guy on the behesht teapot is Naser al-Din Shah Qajar, shah of Persia, 1848 - 1896. 1. Sometimes you need to track down multiple paths to find an answer. 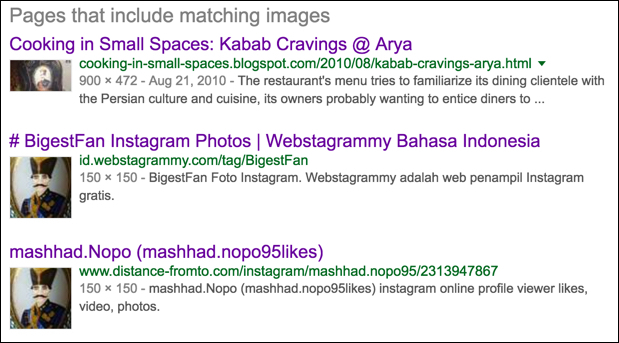 In this case, I tried reverse image search (which didn't really work well), then used a cropped image and found several bloggers using the image as their avatar. 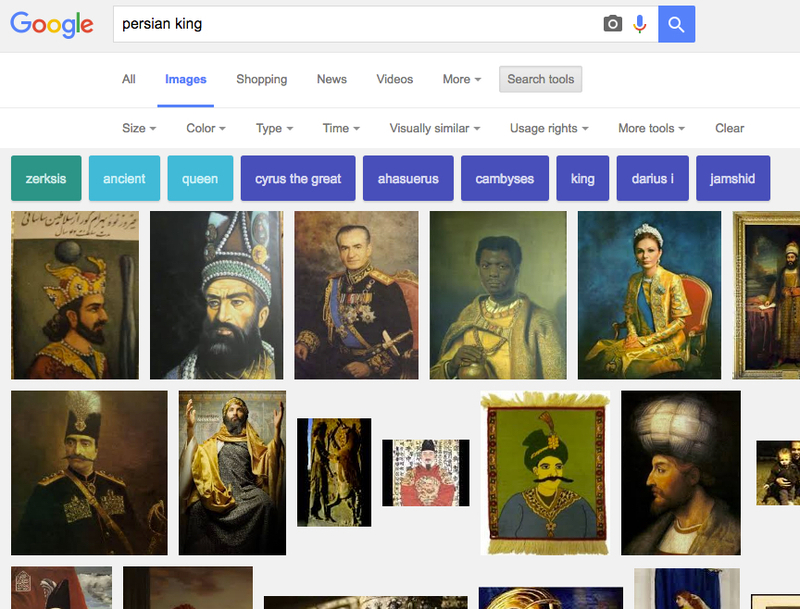 By augmenting the image search with a guess about the role of the person ("Persian king") I was able to find a link to the man himself... and all of his wives. 2. Remember to crop your image when the full image search doesn't work. If you focus the image, it usually works to be more like what other people have used as their image. 3. When you have an obvious question, try asking it in plain language. It sometimes works remarkably well. .. and one of the pleasures of travel is discovering new things. And, of course, from a SearchResearch perspective, traveling is just an unending stream of curious moments... many of which bring fascinating Challenges for us to solve. Here's this week's Challenge, derived from my travels to San Diego (I'm here to teach a 1-week class at UCSD). I don't know about you, but these are typical questions that come up for me as I travel. Maybe this happens to you too (if you read this blog, I bet it does!) -- so let's exercise those SearchResearch skills before you head off on summer holidays! As always, tell us HOW you figured out the answers. We all want to learn what great SearchResearch skills you've got. Answer: In the middle of nowhere? It's sometimes hard to predict how hard a Search Challenge will be, but you loyal and skilled SearchResearchers made short work of this! The Challenge began with me scanning around on Google Maps over Greenland one day and spotting a most remarkable thing. 2. What kind of organization would pay to put this thing here? Why? 4. (Extra credit) What's the most interesting story to come out of this place in the place year or so? But how would you figure out what it is? and found a "Category" entry for Research Stations... and it's a short list. A couple of clicks quickly determines that our lat/long is the Summit Station, so-called because it's at the top of the Greenland ice sheet. The OTHER way I thought of to find this was to check out Google Earth. It's worth knowing that there are a LOT of places listed on Earth. I launched Earth, dropped in the lat/long and... nothing. Really? Just because there's something there doesn't mean it's got a label. So, just to check (because I couldn't believe something so interesting wouldn't be covered), I clicked on the Photos option. And THAT was the ticket! When you show the Photos, 4 little photo icons appear, and they (handily enough) have the name of the research station on the image. Once you've got that name, it's a quick search to find the Wikipedia entry on Summit Station, and from there you can find the official Summit Station website, and find out that it's run by the NSF (National Science Foundation). Why are they interested? Because "...year-round monitoring of key climate variables are conducted to study air-snow interactions, knowledge of which is crucial for interpreting data from ice cores drilled in the area and elsewhere." 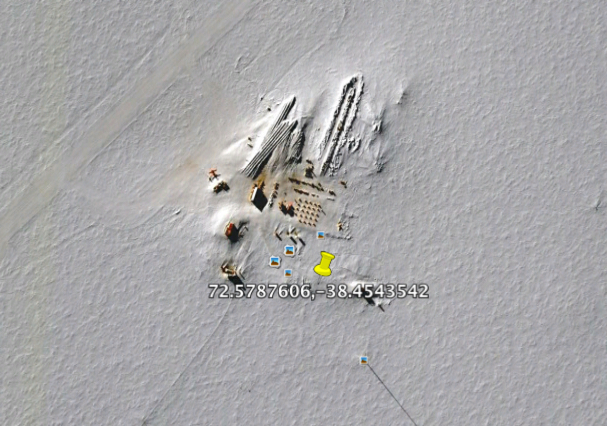 And this research stations is "... located atop 3200 m of ice and is nearly 400 km from the nearest point of land. 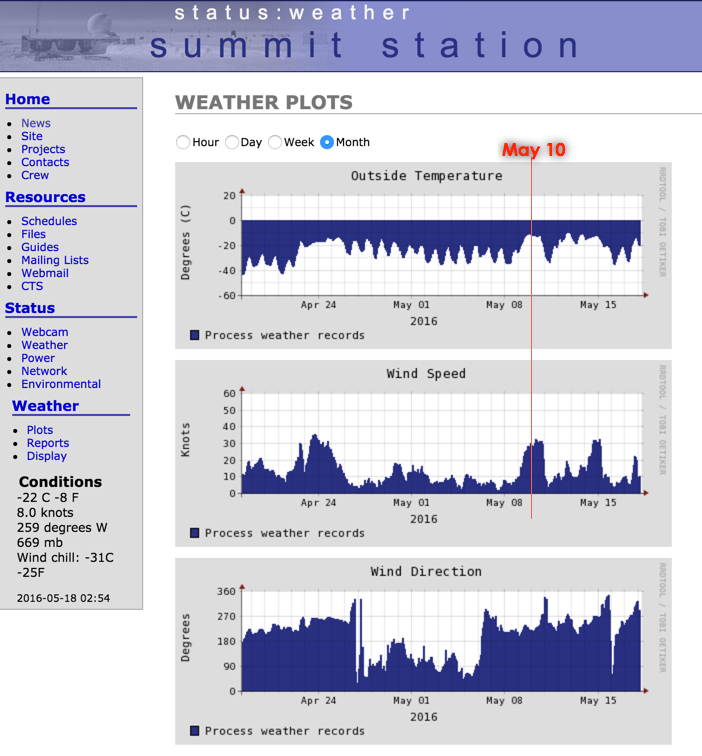 Summit supports a diversity of scientific research, including year-round measurements of air-snow interactions that provide crucial knowledge for interpreting data from deep ice cores drilled both at Summit and elsewhere." In other words, it's a place like no other, and they need it to get baseline data for studies of ice cores, which show us temperature variations over the past thousand years or so. If you don't know this, you can't make sense of what data you're seeing. In looking at their website, after a few clicks, you'll find that they have two blogs for news about the site, only one of which has recent entries (the other seems to have been abandoned a few years ago). On that blog you'll find that "...In February, scientists predicted that atmospheric conditions in the Arctic may enable... atmospheric ozone to reach record low levels in 2016–potentially opening a so-called ozone hole." If you remember your history, the previous ozone hole was in the Antarctic, to date, there's never been one in the Northern Hemisphere. This may be changing. If so, here's what it means for you. As one of the research scientists writes: "Stock up on sunscreen..."
1. Check resources that may not be the first one on your list. The Google Earth idea was great, but I had to use the Photos option to find a name. Once I had that, then I could answer everything else. 2. Read the text carefully. I know I say this all the time, but the primary cause of errors (among the students I teach) is inaccurate reading of the web pages. They can FIND the content alright (usually), but then make a mistake in simply reading the content. This is how I noticed that one of the blogs is way out of date. Just read! I hope you enjoyed this. I certainly had fun reading about the station. As Remmij pointed out, the photo of the station with the aurora is well worth a look: Summit Station and Northern Lights. Finding things like this, and reading the comments you've made and the discoveries we all share, is what makes me keep coming back to the blog. Thanks for all you do, gentle readers! P.S. Sorry about being delayed in getting the answers out over the past couple of weeks. I've been working really hard at various conferences and teaching gigs. (I'm in San Diego this week, teaching ethnographic methods at UCSD.) While these things are great fun, they also mess up my schedule quite a bit. I try, but sometimes I get behind. Hang in there--I won't leave you hanging high and dry! Search Challenge (5/11/16): In the middle of nowhere? ... yet, it's something we often want to know. There are often places that are intriguing, but that have no handy signposts to tell you what's going on. What do you do when you want to find out about a place that's in the middle of nowhere? Can you find the answers to this Challenge? Be sure to tell us HOW you found out! Answer: Which animals are associated with what professions? This week we're looking for animals that are closely linked to certain professions. 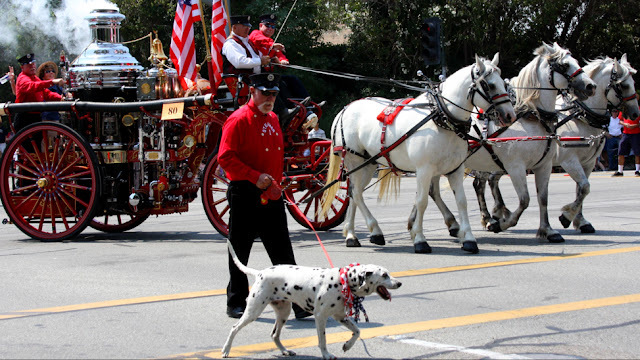 Dalmatian dogs are often thought of as "firefighter dogs." Can you find an animal that's closely linked to a particular profession? What's the animal? What's the profession? And what's the connection? This is both a fun question (which animals can you think of? ), and a hard question: HOW would you do this search. From looking at the comments this week, it's clear that lots of people knew things off the top of their head. Jon remembered that: lab rats / scientists or guinea pigs / scientists go together, and that canaries / coal-miners are often mentioned in the same breath. A bit later he also came up with: corgis / Queen Elizabeth (which is clever, but not really a profession, per se). Ramón thought about shepherd dogs / shepherds and snakes / medicine, as well as pigeons / mail carriers. Remmij came up a great list: donkey, elephant, lame ducks / politicians as well as bears, bulls / stockbrokers. And, the remarkable: dolphins / submariners. Marydee recalled that librarians / cats (and more generally, booksellers / cats). While Chris also thought of doctors / tropical fish, although this is stretching the relationship thing just a bit. ... all of these are basically remembered by each of the readers. Almost nobody did a search to find these things. How would you approach this kind of a problem? In my case, I thought about it this way: "What terms would people use to write about such relationships?" and "What patterns of language would they use?" Once I've figured that out, I can try to create a query that expresses that pattern. I was looking for common language expressions that I might use as queries. If you look in the Wikipedia article about the Caduceus, you'll find phrases like "...symbol of medicine" and "...symbol of healthcare." That suggests to me that looking for patterns like [ "symbol of *" ] might be useful. and I found a few things (such as the pineapple as the symbol of hospitality). But it's not quite right. But (currently) there's no good way to say this. Finding a profession / animal pair is tricky--both are difficult to describe. So when you've got a search Challenge like this, you have to think about other ways to express it. and then switching those terms around in various combinations. Notice that I tried synonyms of the emblem/mascot/symbol and of the profession/job/vocation. They all kind-of worked, and by searching with repeated combinations, I was able to find a few more things (mostly repeats from above). Then I thought to try Images as a way to search for these things. And that was surprisingly a bit more productive. This repeats our discovery of snakes with medicine. Shows us the rat or mouse is association with scientists. But here was a great one that surprised me: teamster / horses... although it's obvious in retrospect. I wasn't able to find many more than the ones the incredible SRS folks already commented on.. but this was a great search task! 1. Use your social network. In this case, all of the readers of SearchResearch is an impressive "hive mind" you can tap into. You might not be a blogger, but this is one reason to create and curate your own social network. Be at least occasionally a Twitter, G+, Facebook user: It gives you access to people who can think very differently than you do. That difference in perspective can be a valuable thing. 3. Try other modes. In this Challenge, looking in Images was helpful. (I also tried Videos and Books, but they didn't work out.) But often, switching resource types can give you a great set of suggestions. 4. Look for common language to use in a pattern. Try searching for common language expressions that show up in articles that are along the lines of what you're seking. 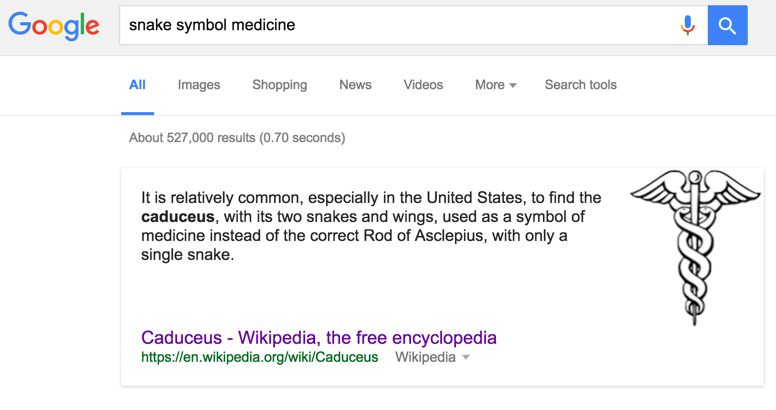 Above, we looked at the Wikipedia article about the Caduceus and found phrases like "...symbol of medicine" and "...symbol of healthcare." From this we learned that a common term--symbol--in a common phrase like "symbol of X" can be a useful search pattern. I hope you enjoyed this Challenge. Your answers were excellent! 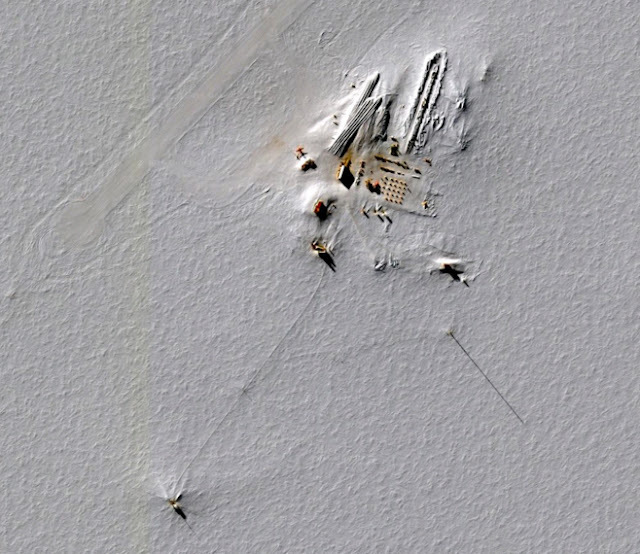 Answer: What are those smoke plumes?